October | 2013 | ¡Ay, yay, yay, Capitana! For the uninitiated, this holiday may be a complete mystery. For the traditionalists, it is perhaps the most sacred. The day of the dead is a Mexican holiday that, as many Mexican spiritual traditions, has found cult-like status in the cultural diaspora, as we Chicanos continue to spread across the Americas and world. 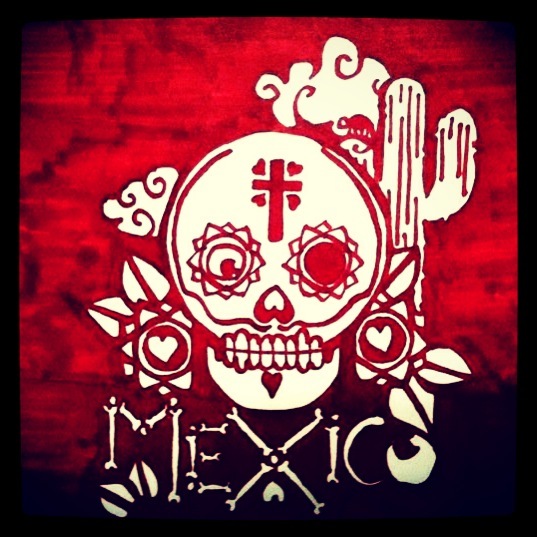 Mexico is certainly a culture that is obsessed with the juxtaposition of life unto death and love unto pain. Suffering is as common of a theme in Mexican folklore, music, and art, as is the reverence of the divine. Some have criticized it as a cult of death, but it is quite the opposite. It is a culture that relentlessly worships the profound nature of living, as opposed to hiding from its impermanence. As a Latina and a Mexican folklorist-hobbyist, I am pleased to present the above ofrenda as well as my own recorded version of the classic epic folk song, La Llorona. La Llorona is a song I’ve grown up loving.. Not just loving, but singing with my guts and grit. A Mexican folk song, it carries with it deep traditions of the music and culture of Mexico, and the general spirit of “la puebla.” A song of death, dying, despair, and loneliness, it is a chronicle of the most epic of ballads. Truly a woman’s allegory, this song epitomizes the voice of “la llorona,” or, the weeping woman. This song is close to my heart and deeply influenced my style as a performer and songwriter. I hope you enjoy my interpretation of this iconic piece, and I hope I do justice to its roots and pay homage to La Chavela. It is difficult to pinpoint exactly who was the first to compose the song “La Llorona”, since it stems from the hundred-year-old urban legend. However, the song was first made well-known to contemporary audiences in 1993 by the Costa Rican-born singer Chavela Vargas. The song’s name and inspiration comes from the urban legend of La Llorona popular in North and South America. The story is of a woman said to haunt the valleys of Mexico, weeping for her children whom she drowned in a fit of madness. There are many versions to the story, but all are a variation of certain details. In one version, a woman drowns her kids because the man she had been seeing wanted to break things off with her. He did not want someone who already had a family. After he finds out about that she killed her children, however, the man leaves her indefinitely and she then commits suicide. Although the story lines differ when comparing the song and the legend, both integrate common themes such as loneliness and despair. One popular interpretation of the song is of the singer feeling trapped by this woman (La Llorona) who has fallen in love with him. If he even thinks about leaving her, she weeps. He tries everything in his power to leave her, but he is trapped by the woman’s twisted mind games. He wishes to be taken down to the river to be drowned, and so then his suffering can finally end. The suffering that the man goes through from being trapped in a relationship with a woman in a way parallels the suffering that the woman in the legend goes through from having her lover leave her.